Okay, first a warning. After all you, the reader, deserve to be warned. Nature, in blind disregard, does not grant that privilege. Survival affords no foresight. But here it is: If you require a sympathetic, likeable protagonist this is not your novel. If you want a story with redemption, turn away. 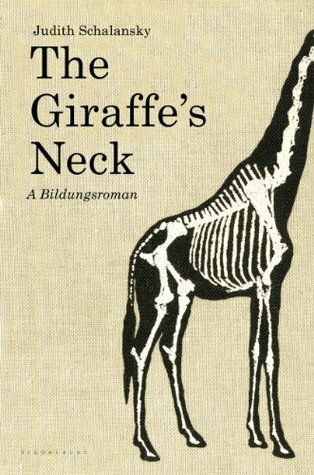 But if you want to read a book that is intelligent, darkly satirical, and beautifully illustrated, The Giraffe’s Neck (Bloomsbury), the second novel from the young German author Judith Schalansky, is an original, engaging and, ultimately, gut wrenching read. Inge Lohmark is a biology teacher at a school in the former East Germany, where reunification has shifted the economic environment so rapidly that the native inhabitants are struggling to adapt. The population is declining. Within four years the school where she has taught for the past three decades will close its doors for good. For all her passion for natural history, teaching is not a vocation for Inge so much as a call to arms, a battle in which she faces down the enemy year after year, employing the tools of the evolutionary biologist – define, classify, and label the specimen who pass through her classroom with the faint hope that she can force some knowledge into their adolescent heads. Outside the classroom her life is similarly ordered and seemingly devoid of compassion. Her husband Wolfgang has become obsessed with ostriches, tending to his beloved flock, expanding his business, and frequently going days without crossing paths with his wife. Their daughter Claudia is in America, she left for study years earlier but has always found a reason to stay. Inge is clearly emotionally conflicted as she looks forward to looming retirement but her resolute, stubborn nature leaves little room for cracks to form in her tough facade. Until a curious attraction to a female student sets her off balance. Balanced against Inge’s internal tirades are truly lyrical passages describing the countryside and clear indications that her self control is hiding pain rather than pride, interspersed with delicately beautiful illustrations by the author. The overall effect is original and impressive. Evolutionary biology, in Schlansky’s hands, serves as a metaphor for the challenges facing the former GDR as it struggles to adjust to a rapidly shifting environment. Adaptation is critical for survival, but even successful strategies come with advantages and costs. Change the circumstances too fast and yesterday’s asset is today’s weakness. International Foreign Fiction Prize 2015: This is my fifth read from the longlist. Again it strikes an entirely fresh tone from the books I have read to date. The translator, Shaun Whiteside, has translated a wide range of German authors (as well as also working with French, Italian and Dutch). The distinctive and fresh character of this exciting young German author comes through nicely. Some readers are likely to find the narrator’s character difficult but with a strong affection for Beckett and Bernhard I found it to be a delight. There is, after all, a deeper and important thread beneath the surface, as in all good dark satire. Sounds as if it deserves its place on the longlist. I’m interested in your comments on the use of evolutionary biology as a metaphor for the challenges facing a changing country. Did it feel heavy-handed in any way or has the author handled it with a lightness of touch? The narrator is so bitter and misanthropic that you have to read her as over the top (with a good measure of black humour) so yes, I would say it is light. I have a fair amount of evolutionary biology in my (distant) academic background so I could see the allusions she was making. Looking at reviews on Goodreads I think much of this book was lost on many readers. She is critiquing both socialism and capitalism and the shortcomings of both and the challenges facing the former east Germany thrown into a world in which the rules of competition and survival have changed. It is a fascinating book, very different, funny and ugly at once with these beautiful illustrations throughout. Schalansky deserves the attention. I am not sure if it will make the shortlist but who knows. I still have 10 more books to finish! I really enjoyed this book – very thought-provoking, and the illustrations are exquisite. I had not heard of it before the IFFP list came out. As I just responded to JaquiWine, many reviewers on Goodreads missed the humour and satire altogether. I bought an e-book because the hardcover is not readily available in Canada, however I will say the kindle version was very well formatted for the illustrations which is not always the case. Ooh, call me intrigued! I’m going to have to look for this one. My copy of The Giraffe’s Neck arrived in the post today so I will be reading it some time next week – I’m interested to see how it compares to the different kind of satire in Look Who’s Back. I’m looking forward to this one, particularly since your review of it. It seems to have much personal connection to me, as I was a teacher in Germany when the Wall was up, although I taught on the West side. I’ve longed to visit it since, with the reunification even though that brought its own difficulties. One thing about the IFFP books is that they don’t often elicit feelings of great joy and happiness. But, they are deeply moving and thought provoking. For those reasons, for the ways that they bring me in touch with a country not my own, I love them. Good point; miserable I was not. Hmm this makes me really interested in hearing your thoughts on it, especially the political messages! I was looking forward to reading this as I remembered her first book, Atlas of Remote Islands, getting good reviews. After your review I am even more eager to start reading, however I’m so misanthropic myself I’m not sure if I’ll notice it’s over the top! Or you will find yourself chuckling along in agreement as she dissects her fellow human beings! Either way it’s a refreshingly original work in my mind. I didn’t enjoy it as much as you did, but I think that was because I didn’t like the character. I also found the commentary on politics, etc. interesting, but it couldn’t redeem the book for me. Reading your review, I realized that I forgot to mention the illustrations in mine. They’re gorgeous! The dark satirical humour is not for everyone I know, but age may play a part too. I am considerably older than you and I have grown to really appreciate this type of satire the older and more cynical I get. 🙂 The contrast with the illustrations is part of what makes it work. Without them it would not be so effective.